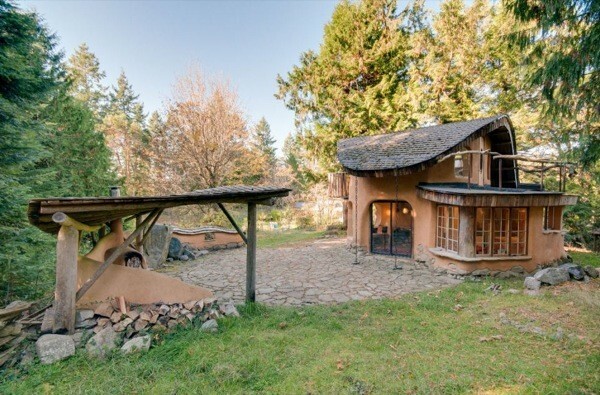 Check out this two-story fairytale cob cottage nestled in the woods of Mayne Island in British Columbia. For a cob home this one looks amazing to live in full time. I personally, love the textured stone flooring. Downstairs is the living area with glass sliding doors that open to the beautiful stone courtyard to expand the living area outdoors. A indoor fireplace keeps the home warm during the weather. The kitchen has lots of counter space and a built-in dining table. The cozy bathroom has a built-in wood shelf for towels and other wood details. Up the Douglas fir stairs is the bedroom with a outdoor balcony and skylights to provide tons of natural sunlight. 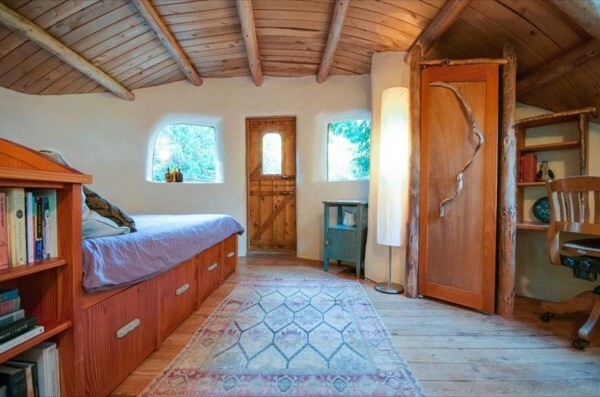 Could you live in a cob cottage like this one full time? Please enjoy and share below. You can share this Little Fairytale Cob Cottage with your friends and family for free using the e-mail and social media re-share buttons below. Thanks. If you enjoyed this Little Fairytale Cob Cottage you’ll absolutely LOVE our Free Daily Tiny House Newsletter with even more! Thank you! Oh so whimsical and fairytale like. I love it. Magically delicious, as we used to say! So organic and adorable, all the good things in a fantastic location. I keep looking for a hobbit to pop out. It is so delightful. Thanks, Andrea, this lifted my day. I love it! A hobbit house that’s spacious and light, with navigable stairs (if one can do stairs at all). Meant to ask: what is cob exactly? Cob: the central, cylindrical, woody part of the corn ear to which the grains, or kernels, are attached. Straw, sand clay mix. See Cob Cottage Company in OR site or Mud Girls in BC. More stuff in my area, nice to see. My neighbours have a cob house and there are several on the island. One of the best features at their house is a heated cob bench, perfect spot to cosy up for a cup of tea in winter. very cool!!! what do you do for power, water and sewage? I love this. My next build i hope to use hempcrete. How much does this beautiful fairytale cottage cost???? I would like to have one. Can we have this built for us. Would you send me more info. on this one please??? It’s funny if you go to the Airbnb site and view the entire suite of pictures, the dwelling changes a bit. The bed has been moved to a different wall in some pictures, and the kitchen decor has been removed from others. One wonders what the place really looks like =). Either way it’s totally charming, I’d LOVE to stay there. Any ideas on why the roof has ventilation holes along it’s perimeter? I saw those holes, too. and thought they were built for martins to nest in…they remind me of the purple Martin houses people have in their yards here in the south. How much would something like this cost? And if I want a contractor to build it for me, who would I talk to?? I’m serious about building one but I want someone that’s done this kind of professional work to build one for me. I could live here in a split second for the rest of my life!!. However being that I am disabled I would need a downstairs bed (Murphy bed, maybe) and use the loft bed for quests. Would that be possible? Would also need a couple recliners instead of a couch. Let me know when this is for sale! Love it! OOOh! I would love that and soo cozy feeling of a Art look with Natural environment. Where can I get one too? Just a dream. I would love this. It appears that it has two bedrooms, though, and the bathroom lay out is confusing. I wish we had either more photos or a floor plan. I have a friend in South Africa who built her own cob house with her husband. It was fascinating to read about it. Absolutely the best I have ever seen. My dream home. Living in this house would be like living a fairytale. It’s magical. Thanks for sharing it. Perfect!!!!! If it doesn’t have a second bath, it can be added . . . I love this! It’s perfect for a mountain getaway. What is the square footage of this gem? Is there a floorplan available? Ha ha, now there’s an interesting question. How DO you calculate square footage when the entire house is wonderfully curvy? A floor plan? I hope not 🙂 I like to think this was spontaneous as they moved the cobs around to capture the best light for those stunning windows. Cahow mentioned more photos elsewhere. Perhaps we should visit to get more information, although I’d prefer to think hobbits did this. Beautiful House in a gorgeous area, but I’m a die hard California, warm climate, city “boy.” There is no way I could even live in this for a week. It’s for you bug,mosquito,animal,trees, yard work, seasons, below 60F temperatures lovers. ENJOY! So city boy do you have a city style tiny or want one? I absolutely adore this place. Everything about it is attractive from the walls to the floors and fireplace. It is just awesome. than I really care for. The outside is a killer for me tho, looks like a Hobbit just stepped out of it. And I would be heating it with propane instead of a woodstove. That made me wonder what happened with the fireplace, they have one but have an ugly wood stove in front of it set up on some concrete pavers. The fireplace is beautiful but maybe they made some mistakes in making it and it could not be used. My thought is, they found out just how inefficient fireplaces are for heating. A wood stove like that one is very much more efficient for heating – the chimney run up the fireplace chimney. Whoever decided to put the stove in didn’t seem to care about looks tho. It wouldn’t be rocket science to come up with a much more eye appealing setup. Me, I think I would move the stove across the room, make it freestanding, with the stovepipe going straight up. That would give you heat. I’d put it on a tile mosaic to stand on, and tile on the wall behind it too. Looks would really improve like that. Then I’d change the fireplace over for a propane fire, or electric, both with phony log fire (Well, actually, I’d have gone that route from the git go; that is, if I wanted wood heat, my first preference would be a electric or gas furnace. I tend to think things like that out beforehand, unlike so many of the tiny home designers.). With a built in fan, you’d get some heat, but that’s secondary, it would look fantastic with either, turn the lights off, light up the fireplace, sit in front of it with your sweetie, and it would be just like real wood fire, except you wouldn’t have to mess with logs, ashes, and so on. Personally, I would not want to live in most of the designs I have seen; however, with just minimal changes in the designs, I wouldn’t mind living in more of them. They should have incorporated a Russian fireplace into the design to keep the look while efficiently heating the home. Yes, a Russian stove would be efficient. But cost would probably be high for one, and some do look ugly. Well worth considering at any rate. And as for the stove in front of the fireplace, bah. They make stoves that actually fit in the fireplace, and are a lot more attractive. All immaterial for me, I’m looking for a vehicle to convert to a camper, and will likely be using a small wood stove for heat. Thanks Sally, but I can find neither Cahow’s comment nor what web site to find this. I would prefer numerical pagination, too, so you at least know where you are and where you have already looked. ALEX!!!! I HATE-HATE-HATE-HATE THIS STUPID NEW FORMAT!!!! Ditto what Cahow said in every respect. I agree on the comment pagination being a step backwards. Perhaps the fix would be to have a “see all comments” link which takes you a page with all the comments on it. That way you’d have the best of both. I hear you guys. Okay. I’ll put some more thought into this. It’s impossible to please everyone because others don’t want to scroll endlessly through all the comments but there’s got to be a better solution than this. I’ll work on improving it. Thanks so much for the helpful feedback. Hey, Alex. I’m SO glad that we heard back from you about the frustration that some of your regulars are experiencing in regards to the Comments change. I’m going to be terribly selfish, HERE: I don’t give a toss about those people who “…don’t want to scroll through all the comments”…unless YOU are one of them, Alex! (LOL) But, with very few exceptions, MOST of your blog postings have 20 comments or less and if a reader can’t manage to FF through comments, oh well…welcome to the Internet. I daily frequent at least 10 different message boards, from work related to pleasure and 100% of those sites show ALL THE COMMENTS! Mind you, 1/2 of the sites will show multiple comments but then they will also list under the primary comments “Show Replies” and at the end of that particular pages comments, there will be a bar that states “Load More Comments.” From youtube to E.W. to MSNBC, that’s how everyone of those sites features responses. I honestly have never visited any website that features the current option of “Previous Comments” and “Next Comments.” They may exist, I merely haven’t seen it anywhere else. .. I like the English country/almost Deco feel of this little cottage and the way it’s been situated to make good use of the light .. Very nice .. It kinda reminds me of my Grandmother’s house, but in a much smaller and rustic style ..
Bilbo Baggins was definitely here. 🙂 Yes it would be interesting to know the square footage of this sweet little home (and how to calculate it). It looks comfortably roomy and nicely designed to track natural light throughout the day. It appears to combine a number of different shapes; round, square, oblong, straight, etc., and in a way that flows beautifully from one space into another. This cottage looks like it offers the same structural advantages as a “dome home” but without the monotony and challenge of having to design the interior to fit a continuous circle. Everything about this beautiful cob cottage makes me want to smile. I could easily live in this elegantly simple space. It is luxurious, but so incredibly sweet and simple. The only thing I would change is the sink top. I think it would be a challenge to wipe it down. Otherwise, I love this home! We have a country cottage style kitchen and my wife insisted I do tile countertops. I never did it before but after the research they turned out beautiful. Now years later I told her I would NEVER want tile ever again. She works in sale of floor covering and countertops and told me when I said it that that is what all her customers say who have had them! In a hot second, I would live here faster than you can say “spit!” Thank you for sharing! Yes. I love this little home. I am fanciful person, so this fits my personality perfectly. I want to live in it! I love it! Very delightful. Tiny architectural dream home ,What a Jewel! Uh Oh someone call the Dr I think my heart just exploded. This is to die for. Beautiful. Oh yes! Charming, comfy-curvy and human supportive . A new fave. Absolutely LOVE this. Could live very happily in it. A magical place! I’d like to see tiny (or small) homes designed for seniors. Adorable and looks very comfy—except for me that staircase–which is beautiful and all but many people like me can’t do stairs–this of course was not meant for me tho! For those who will surely ask–I think that wood stove is a SCANDIA or maybe even a JOTUL. IT most likely has a rear-exit stove pipe fitting as it does not look deep enough into the surround to have a top exit unless there is some ducting I am not seeing. Yeah! I absolutely love it. I love it!! So sweet, fantasical!! Is that a word? it is now, magical and fantastic combined!! I want one!! Absolutely beautiful! Would love to know who crafted the buildings, how long it took, etc. Lovely work. 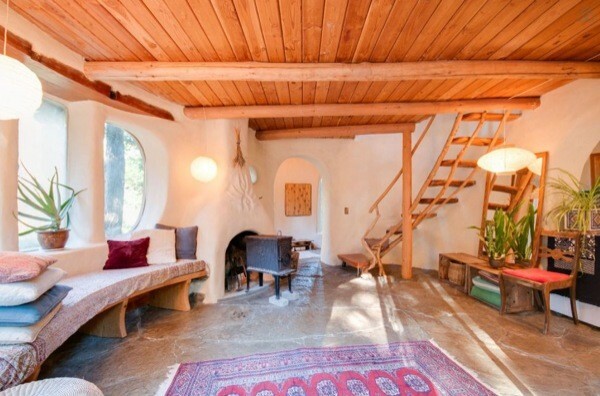 Whoever designed this cob house, did the most beautiful Job I have ever seen. I would never leave except to purchase food. My very first post ever. When I go to sleep, I will dream about this place and how I live there. This is one of the coolest places I have EVER seen. I absolutely LOVE every part of it!! I absolutely love this house I’d love to have the blue prints and cost to build this home. I’m designing some homes I bought a home designer for my computer, but I don’t have to look any further THIS IS WHAT I’M LOOKING FOR AND WHAT I WANT.. There is not one thing I don’t love about this home. Are the walls stucco that they curve so beautifully? A fireplace? Upstairs bedrooms? Dare I ask the cost? this is the house….like a healing house! how beautiful! so, could be a thow? has a foundation? basement?? anything is possible with a design like thizzzzzzz. hooray! a design for others like seniors, challenged in any way, so holistic. funny what a few curves will do for the psyche, eh. My husband and I would love to have this house built for us. We were thinking somewhere in the mountains by a lake. but this is the one for us. When we saw this one it made our hearts sing. A bit curvy, but very nice. However, I would definitely have some sort of bathroom upstairs, as well as down, even if it’s only a composting toilet. Also would go for propane rather than wood. this is really nice,,,but the average builder of a tiny house needs dimensional lumber. you know…nice and square. that said, this is beautiful. i could live here! In this example, the “…average builder needs…” a clay mud mix similar to adobe plus two hands and imagination and a willingness to have FUN! As in this example, cob can be molded into complex shapes, such as curving walls and ceilings. Ease of use plus the resultant thermal mass and the exclusion of outside sound makes cob the top contender for DIY homemakers. We’re keeping several shots from little fairytale cob cottage as screensavers. It’s that interesting. Oh wow! beyond charming…..love it all!!! There is a lot of room in and above the bed to snuggle or read. The stairs are absolutely structurally adequate. It is a wonderful little home that the owner should be proud of. Lovely use of natural materials and colours. There is beauty in simplicity. The floor appears to be polished concrete, stained then sealed. Used this way, a concrete floor ties the structure into the thermal mass of this particular planet, reducing temperature swings inside the structure… and reducing the need for heating and cooling by brute force. I prefer temperature control by this simple design, instead of temperature control by burning wood or paying utility companies for electricity or gas. And I think we can all agree, utilities can be interrupted by disaster… or loss of income. The massive thermal mass designed into this home equates to long-term comfort and security. And without wood walls to conduct sound, can you imagine how quiet it is inside! Concrete and cob/adobe seem safer. I wonder if wood buildings are next in line for a safety warning, something stating they may result in death or disfigurement during a fire. Shucks, just about everything else gets a safety sticker. My favorite was on a straw hat, stating it ‘should not be used as a flotation device’. So, next time I’m drowning, keep your hat on. I’ll thank you later. as previously stated, …”the construction materials would surely make a comfortable enviornment….” now it is a year later and the stairs still look scary, even tho they may be sound. The interior of this house is not designed for full time living by real people who cook and do laundry and store clothing and Christmas ornaments. I would love to have a house built with these materials (cob, a poor mans cement product) because I do appreciate the benefits of mass in building. Yes! Fabulous! (I have a secret aversion to straight lines and square corners 😉 Love all the curves, down to the hand rail next to the toilet. Loved your home. Can I get a plan of it? I think it’s very practical. Trying to decide where to put it. By the river, mountains, valley? Too pretty. Absolutely love it! Beautiful home love it the design is great. Have been watching the houses and reading everything I could find on small houses for the last two years. Love your site here Alex your doing a great job my first post and I read them all. Amazing!!!!!! Would love to see it in person!!!!! Magnifique, cela donne envie de cabanner. Beaucoup de courage pour oser. Merci de m’avoir fait rêver. I hope the owners get moved out by the time I get there to take over. This home is amazing. ALL of it!! This is a lovely homes. Still haven’t seen any answers to the questions of how much this cost to build! More awesome than words can describe. Looking at the first photo, made me think of a mushroom. I love everything about this house. It may be my favorite. I’m not really good with stairs-bad balance and knees-but I would deal with it to live here. Great balcony. Love all the curves, floor, windows, kitchen tiles. I can’t say enough good things. I would love to carve a wooden fireplace mantel for it. I love carving wood! What I would LOVE to see is a place that Is set up for these tiny homes. Kind of like a rv park. And maybe have a centralized area for showering or toilets. That way, it could be easier on all and not having to dump. Plus there could be a community type gardening to have fresh produce year around. And if a person wishes to move on, they could. Thanks so much for posting the photos of this magical house! There are some cob homes here in France where I live and I love the organically curved walls. Beautiful. So bright and spacious and curvey. One of my favorites. What is not to love about this layout. I could stay here forever. I am like everyone else. I love love love love love love love this. Feel, , ..It has romance,it has pizzaz, I would love to have a hideaway place like this in the woods. Keep a candle for me In The window. I am looking for someone who wants this too. I have been married for over 24 years, but it is time for a cha ge in my life to do what I have missed out on. Things I had never got to do. He never let me work, ( I did before I met him ) but on the plus side, I am what one would call a Jill of all trades. I can grow most anything, sew, cook, do woodworking, fix things, cook , clean, design….and much more. I would love to make a lovely sitting garden too! I am also a artist and have many skills. Including finishing up one of these places. 🙂 I have a eye for detail and making things unique …one of a kind! I am looking for a place to live as long as life will let me. I would love to help you in many ways like cleaning up the home and other things. I guess if it had a name, it would be called a live in housekeeper? I guarantee you would not be sorry. If you want to enjoy company, I would love to also. I have a service dog who was stolen from me last month. It broke my heart. I searched day and night for him. He is a gentle and kind dog, housebroken, doesn’t bark unless something is out there. He Is a inside dog. He never tears up anything. And loves to please so much. He does not “smell” like a dog. So, no odors. Losing him for 11 heartbreaking days was one of the most hardest things in my life for me. I do not like where I am at now. And the people are not nice around here. They stole my dog and he is the most valuable thing in life to me. I am looking for quietness and solitude. Enjoying nature as much as possible. Want to know more about me? Please ask. I can pass a background check and have only had ONE ticket in my life. I do not steal or cheat. I used to have my own housecleaning business before I married. They had trust in me. I like natural things, herbal things too are my favorite. I want to live again….. If anyone is seriously interested in collaborating on building and sharing a house similar to this one, please e-mail or call me right away at 714-653-3160. I own an acre of vacant land in beautiful, year round sunny San Diego, California. There’s an abundance of soil that we can use to build a lovely, fairytale cob-style village with plenty of extra room to grow an organic community garden with a variety of fruit-bearing trees and even enough land to build a small, whimsical swimming pool. It’s very economical to build a cob house like this and the land is paid for in full, free and clear. It’s located in a nice, quiet residential area at the end of a cul-de-sac that’s about a mile from the world famous Coronado Hotel and Imperial Beach. It would be a wonderful way to show city planning officials an economically feasible way to teach the homeless members of our society a new way to rebuild their lives and restore their dignity, while developing new skills that they can then use to help support themselves and their families. If anyone is interested in being a part of this project, please call me at the number above for more information. I hope to hear my phone ringing soon! Magical, stunning, and yet earthy. I especially love the whimsy in the design. I could be very happy in this place! This has been in my favs for some time. Nice to know where it lives. Couldn’t handle the stairs. Love the bathroom. It all looks so warm and friendly. This is the first one I really really liked. Are these on a permanent foundation ? Am I right in assuming you still need a piece of land to put it on ? Sandra, yes cob is built as a permanent house, on the ground. I have been dreaming of building or refurbish my own space since I was 11. That was the year I found a Mother Earth News magazine in a yard sale. I’ve read it since. Cob was the first material that really spoke to me. To sculpt your house as you build it seemed a seamless merging of practical, and well, me. Now I’m looking for live-love-work space that will last the rest of my life. Thank you for posting this cob house. I’d let the idea get lost in wheel-based options. …and I would live here forever and ever. This is the THIRD time I’ve seen this house via one of your e-mails! PLEASE STOP sending the SAME old articles out OVER and OVER again! If you don’t have NEW material, send out fewer links, or send the e-mail less frequently. There was once a large cake in the shape of the house of the Smurfs. It was all cream with hazelnut cream and icing . The form was a delight a sculpture by real Craftsmen Artist, from sinuous shapes. THIS IS ADORABLE AND CERTAINLY LOOKS CHEERFUL. IT EVEN HAS A DECK. THIS IS GREAT FOR ASTRONOMY LOVERS. A PLAY HOUSE DREAM, AND FULL OF WARMTH.